פרענומעראנטען Prenumerattenen ..What’s that ? ? Prenumeratten are the supporters who help an author to lower the cost of printing a Sefer by pre-purchasing copies. 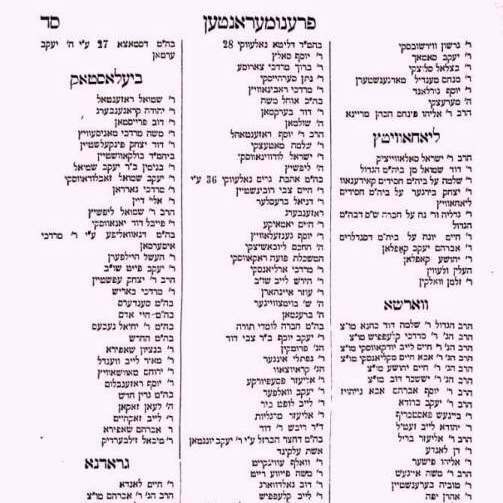 These lists of names and communities are found in many pre-war Seforim from Europe and North Africa. Today with the internet maybe we can save Talmidei Hachamim the time and expense of traveling from community to community to find supporters. You can become a Prenumeratter right now and join the list below! Use our registration page to make your donation to the author or publisher (or Yeshiva) of your choice. who faithfully served several congregations in England and South Africa.